Google's Pixel 2 and Pixel 2 XL have commanded the phone camera throne since launch, producing astonishingly good photos that are unsurpassed by rivals of a similar era such as the iPhone X and Samsung Galaxy Note 8. Features like Google’s single-camera simulated background blur have been blowing people away with its results, but in 2018 a new challenger has appeared in the Samsung Galaxy S9 and Galaxy S9+. Both pack upgraded camera systems in an attempt to retake the crown. The Plus model in particular – and the focus of this article – moves to a Note 8-like dual camera solution with several significant additions, along with improvements to image processing. On the hardware side, we have a 12-megapixel primary sensor with 1.4µm pixels and dual-pixel phase detection autofocus (PDAF), the same set of specs as the main Galaxy S8 camera. But the new addition here is the lens, which features a hardware-adjustable aperture with two settings: an ultra-wide f/1.5 (up from f/1.7 on the S8), and a more traditional f/2.4. The idea is the wider f/1.5 aperture can be used for brighter low light captures, while f/2.4 can be used for daytime shots without needing to worry about a restrictive, shallow depth of field. The secondary camera is also 12-megapixel, but here we have 1µm pixels and standard autofocus, along with an f/2.4 52mm lens, providing a 2x zoom relative to the main camera. This is essentially the same setup as the Galaxy Note 8’s secondary camera. There’s OIS for both cameras, too. And on the front, there’s an 8-megapixel shooter with an f/1.7 25mm lens with autofocus and 1.22µm pixels. Basically the same as the Galaxy S8 in this department. 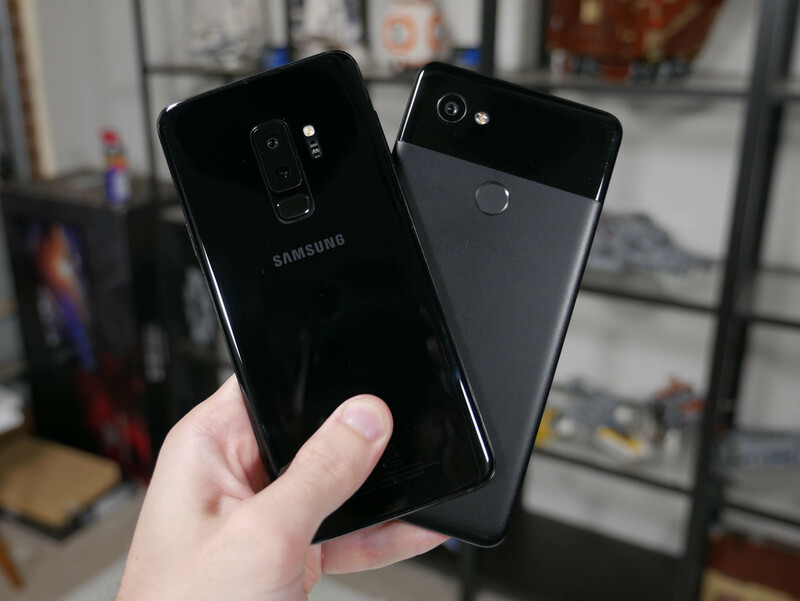 In this article we’re putting the Galaxy S9+ in a head to head battle with the Pixel 2 XL, across every aspect of camera performance. After all, a flagship handset should be aiming to dethrone the best camera on the market and provide buyers with the ultimate smartphone camera experience. Can Samsung's Galaxy S9+ do it? As far as the Pixel 2 XL’s camera hardware goes, we have just a single camera on the rear: a 12-megapixel sensor with 1.4µm pixels and dual-pixel PDAF paired with an f/1.8 27mm lens and OIS. Similar to the Galaxy S9+ from a hardware perspective, minus the dual-aperture lens and additional sensor. On the front is an 8-megapixel selfie camera with an f/2.4 25mm lens and 1.4µm pixels. We’ll start this comparison looking at some photos taken in good outdoor and indoor lighting. Throughout this entire comparison, photos were taken in the auto mode unless otherwise specified, with automatic metering in most cases. Spot focusing was occasionally used, and in those cases, the same spot area was used on both devices. First up we have a generic wide angle photo in the beautiful Australian sun. Here the Galaxy S9+ has chosen a more accurate white balance, with a yellower tone versus the slightly ‘cold’ tone to the Pixel 2’s image. However, the Pixel image is exposed correctly, which allows more detail to be captured in the bright concrete path. The Galaxy S9+ image is more vibrant, but lacks depth and the dynamic range of the image is less impressive. Looking closer, it’s clear the Pixel 2 has significantly better image detail. The short brown grass is sharper and more highly detailed in the Pixel image, while the Galaxy S9+ suffers from the dreaded ‘oil painting effect’ due to noise reduction. There’s also much more detail in the leaves on the trees, and the grass in the foreground. Exposure is once again an issue with this photo taken outdoors in bright sunlight. The Core i7 box is washed out in the Galaxy S9+ image as a result of pushing the exposure too high, and as a result there is less depth to the colors. Similarly, the Pixel 2 image has much better depth and detail to the concrete area. This is another photo with incorrect exposure from the Galaxy S9+, a common issue not just with these few samples, but with many photos I took in general with the handset. While this photo is a good test of dynamic range, with the sunny and shadowed areas, it’s the Pixel 2 XL that produces a better shot with plenty of detail in the shadowed area without blowing out highlights in the sunny area. As a result, the Pixel 2 image has far more depth and detail to the rocks, along with a more natural tone. Continuing the trend of exploring automatic HDR, here is an indoor shot that is – and you might have guessed it – overexposed on the Galaxy S9+. The Pixel 2 image delivers more detail on the fence outside and fewer areas of blown out highlights, such as on the floor near the fridge. It is a slightly darker image, but it’s not overwhelmed with crushed shadows. In contrast, the above image is better exposed and better metered on the Galaxy S9+; a rare event. The Galaxy S9+ photo is clearly better here, with a more natural yellowed tone (considering the sunny day), more natural brick tone, no blown out highlights in the clouds and on the roofing in the background, and better dynamic range in general. The Pixel photo isn’t metered correctly and while it does have superior detail, particularly in the rocky area, the photo looks dull and contrast appears artificially inflated. Moving indoors, here we have a shot of some Lindt balls. Interestingly, in most indoor situations with decent enough lighting, the Galaxy S9 opts to use its f/2.4 aperture rather than f/1.5. In this photo, the Pixel 2 XL with its f/1.8 does exhibit slightly better bokeh than the Galaxy S9+ in its f/2.4 mode. In terms of color performance, both images are vibrant, but neither really nails the color balance: the Galaxy S9 photo is too yellow, and the Pixel 2 XL photo is too cold. Again, the Pixel photo has noticeably better detail but both of these photos are very good and hard to split. In this photo I manually used the Galaxy S9’s f/1.5 aperture to compare it to the Pixel 2 XL’s f/1.8 lens. Again, the Galaxy S9 photo is overexposed, but the Pixel 2 XL is a bit dim for the real world conditions, and the Galaxy S9 has produced a more vibrant result. Background blur is similar in both images, with a slight edge to the Galaxy S9. This image is a great example of the perils of oversaturation and incorrect exposure. The Galaxy S9+ photo is brighter and more vibrant, but there are two key things to note: the reflection on the glass table is blown out, whereas there is noticeably more detail in this area in the Pixel 2 XL photo. Also, the Pixel 2 XL photo brings out the subtleties to the pinks and purples of the leaves, with greater color depth. The increased saturation of the Galaxy S9+ photo means you lose this detail and nuance as a result. Again, I think a lot of people would be happy with either image, but the Pixel 2 XL does a better job in this situation. One of the key advantages to getting the Galaxy S9+ is its secondary 2x zoom camera. Some 2x zoom cameras are barely better than a simple digital zoom of the primary camera, however this is not the case with the Galaxy S9+. Comparing a 2x zoom photo taken on the Galaxy to a 2x digitally cropped image from the Pixel shows noticeably more fine detail on the Galaxy S9 image. Here, the Pixel camera solution suffers from not having this additional camera. This image was taken in difficult lighting, with a strong light source to the right causing reflections on the glossy book spines. The Pixel 2 XL image is superior here, with better exposure and white balance, delivering a more neutral black and more detail in the bright reflected areas. The Galaxy image has a pink tone and overexposure causes high-end detail to be lost in the bright reflections. This photo is a clear win for the Pixel 2 XL. There is significantly more detail in the cat’s fur in this photo taken in moderate light, along with more nuances to the fur’s color, which is not a uniform white as accurately portrayed in the Pixel image. The Galaxy S9+ photo is slightly whiter and brighter, but depth and detail is lost as a result. This image was captured using the Galaxy S9+’s f/1.5 lens, so at this point the lighting is dim enough for the wider aperture to be activated, though still bright enough for good results. Both photos here are well saturated and well exposed, probably thanks to the studio lighting used, though the tone to the Pixel 2 XL image is a bit more natural. Again, minor amounts of overexposure and slightly inferior dynamic range to the Galaxy S9+ image have caused a loss of detail in the black Lego model in the background. The Pixel 2 XL image has more depth across the board. This final set of images is a test for how the two phone cameras deal with fast captures, and moving objects. In this test, I dropped the cricket ball from my hands and simultaneously pressed the capture button. The ideal shot would have been the ball mere milimeters from my fingertips after releasing my grip. What actually happened here is the Pixel 2 XL captures a photo from slightly before I press the shutter, as the way the Pixel camera works is it is essentially always recording and delivers a photo instantly on the shutter press. Consistently, in this case, the photo is captured from a moment slightly before I request the photo to be taken. For most people wanting an instant capture, this will be fine. The Galaxy S9+ has a longer shutter delay, which is why you can see the ball has dropped from my hands by a decent way before the capture is taken. This lag of a few hundred milliseconds may annoy those looking for an instant capture, but it’s still quite quick. In terms of motion blur, the Galaxy S9+ universally uses longer shutter speeds in decent lighting as it uses its f/2.4 lens, while the Pixel 2 XL lets in more light through its f/1.8 lens and can capture at a faster shutter speed. As a result, there’s around twice the motion blur in the Galaxy S9+ images, though incidentally the Galaxy S9+’s pixel readout is extremely fast so images taken with this phone exhibit less rolling shutter than with the Pixel 2 XL.